I was really looking forward to this book, and since I had finished Goose Girl and was waiting a day to run to the library to get Enna Burning, I thought I would give a try. I started it, didn't really like the first 50 pages, and I should have set it down and not finished it, but I have a really hard time not finishing a book...good or bad. The story is about Courtney Stone, who wakes up in England, in 1813. I have a hard time with some of the language and crude subjects and maybe I should over look it for the plot and good story line -but I didn't really think either of those were there either. It was not my favorite and I don't recommend it. I don't think that Jane Austen would have liked it either. The only reason I finished it is I felt really bad not doing so, and I skimmed most of it and finished it in one day. 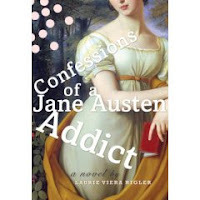 "I dedicate this book to Austen addicts past, present and future; and most of all to Jane Austen, who bit of ivory is an endless source of wisdom and joy for this humble admirer. If there is any justice in the world, Miss Austen, then there is a parallel reality in which that lovely young man from the seaside didn't die young, you lived to write at least six more novels, and the two of you grew happily old together, preferably without children."